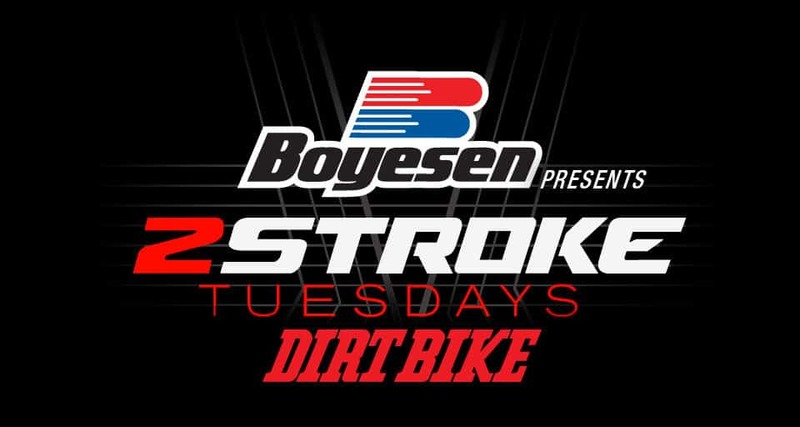 A very sweet KX125 built by Phil Valdez the Precision Concepts Race Team head mechanic is front and center on this weeks Two-Stroke Tuesday brought to you by Boyesen. We don’t stop there 2-Stroke Hardware has products from Engine Ice, FMF and Nitro Circus . If you like Kawasaki’s don’t miss this weeks 2-Stroke theater and fans of the GOAT click the exclusive link at the bottom of this post you won’t be disappointed . Phil has spent lots of late nights in the Precision Concepts race shop working on this KX125. Phil being the head race team mechanic for Precision Concepts Racing he is no stranger to framing a bike. His KX125 got the same treatment as the teams race machines. The engine as you can see was completely dismantled and all the parts that could go through the Cryo Heat process did. See more at www.cryoheat.com on this process. All the chassis bearings were replaced and treated as well. In person the black frame really makes the aluminum parts and the gold colored fork tubes pop. The brake calipers and engine side case received some coating love as well. The engine rebuild process was helped along with a Wrench Rabbit rebuild kit and now features bolt-on items from Moto Hose, Moto Tassinari, Carbon Factory and Pro Circuit. Lots of time and energy went into building this little power plant. The wheel set is modernized using KITE hubs, Excel rims, Braking rotors, Renthal sprocket, Nitro Mousse and Maxxis tires. This is one very sweet looking machine stay tuned for more very shortly! Engine Ice Hi-Performance Coolant is biodegradable, phosphate free & non-toxic; typically reducing operating race temperatures and effectively keeping boil over temperatures to 256°F or less and freeze-up protection to -26° F. “Right out of the bottle” Engine Ice Hi-Performance Coolant is ready to provide you with dependable horsepower and is proven to reduce operating temperatures. The key to horsepower is not losing it! Engine Ice Hi-Performance Coolant is engineered to keep your operating temperatures at optimum performance to not lose power through excess heat. Engine Ice Hi-Performance Coolant will provide you with reliable power and reduced operating temperatures regardless of the terrain you tackle. Factory or privateer, highly modified or stock, all machines benefit from using Engine Ice. Available in both 1/2 gallon and 5-gallon containers from your favorite powersports dealer. Contact: Your local Walmart retail store. NEED MORE 2-STROKE CONTENT? How about the GOAT on his red sled! Click the image below to see more now.